Let us continue with this series of older whiskies. And following last week’s Tomatin 25, Caperdonich 27 and Ben Nevis 27, let’s stick with the “distilleries known for fruity whisky” theme. Like the Tomatin and the Ben Nevis, this Auchroisk was a recent release, and like the Tomatin it was distilled in 1988 and bottled by Malts of Scotland. On Monday I had a review of two red wine cask finished Benromachs; I did not care for either one very much. Today, I have a whisky from another Speyside distillery, but this one is altogether more conventional. It’s from Auchroisk, a distillery that does not have too much of a reputation but which often produces single bourbon casks that are rather fruity and pleasant. See, for example, this older one from the Binny’s/Signatory combo that I rather liked some years ago and this one—also from 1988—that I liked just a bit less. This Blackadder was bottled much earlier than the Signatory and the Cadenhead’s—all the way back in 2007, in fact. 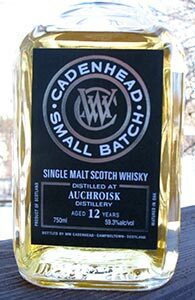 This Auchroisk is yet one more from my ongoing series of reviews of Cadenhead’s bottles I split with some friends. I’ve quite liked the few Auchroisks I’ve tried so far. Those were both middle-aged (see here and here). What will the story be with this not quite teenager from 2001? 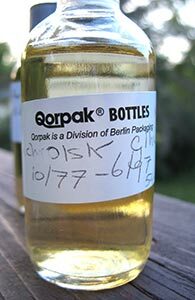 As per Cadenhead’s, “[I]n 2011 the character of Auchroisk was changed” with a 72 hour fermentation now employed in place of a 48 hour fermentation. They say that this bottle is “from the old style”. Unless I’m misunderstanding, surely no one has yet tried the new style. If the new fermentation regime was put into place in 2011, nothing distilled from it could be bottled as Scotch whisky till 2014 at the earliest. 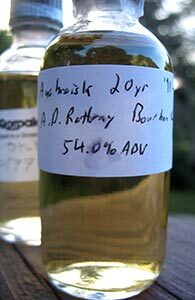 Or is this a typo and did the fermentation time change in 2001? Does anyone know? After yesterday’s review of a 20 yo Auchroisk bottled by A.D. Rattray, here’s another of similar age from a different indie bottler. The bottler is Glenhaven (who used to be active in the US some years ago, but are apparently now defunct) and the whisky is from a different era: distilled in 1977 (just a few years after the distillery opened). Though this review is appearing a day later I tasted it right alongside/after the 1991 Rattray bottling in order to be able to get a good sense of possible differences in profile. This is the first of two reviews of malts from Auchroisk, a distillery I know nothing about other than that it’s in the Speyside, was founded not very long ago, and that almost all of its product goes into Diageo’s blends. Indeed, this may be my first Auchroisk. I thought I’d tried a couple in the past but my spreadsheet has no record of any Auchroisks. This, my friends, is what is known as anti-information. Perhaps your over-taxed brain had room for one more piece of useful minutiae but instead this is what you got. You’re welcome.